May 30, 1935: NBC aired "America's Town Meeting" for the first time on this day. 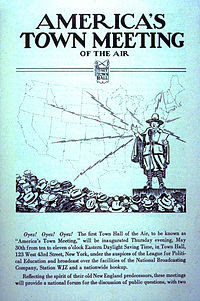 Changing its name to "America's Town Meeting of the Air," it acted as a discussion forum for public affairs. NBC never imagined that the program would be such a success and originally only eighteen of Nbc's affiliates carried the premiere show broadcasting from New York City's Town Hall. As one of radio's earliest talk shows, America Town Meeting began as a six-week experiment but continued to broadcast for 21 years. America’s Town Meeting of the Air broadcast on the NBC Blue Network and continued on ABC Radio.